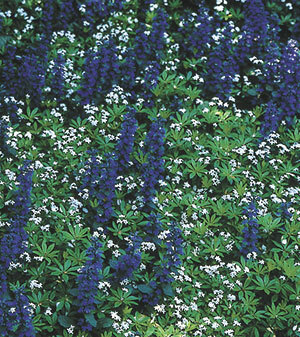 High-maintenance perennial beds can be changed over to, or allowed to become, groundcover and shrub areas. 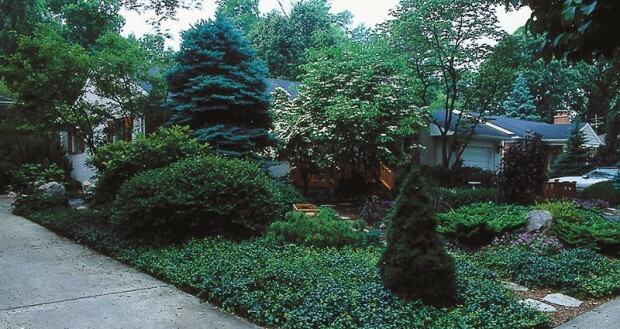 These at the Laudenslager residence contribute foliage color, texture and other benefits, yet require far less care than typical flower gardens. She always seemed to be smiling when she was in the garden. Recently that memory has become a stand-out, a marked contrast to some of what I’ve been seeing in myself and my friends as we acquire age. I see fretting (“This is just too much work anymore”) and hear worry (“That bed’s gotten totally out of control”). I’ve commiserated with others over keeping up with the over-ambitious creations of our own youth. Worst, in contemplative moments I’ve recognized in my own negative thoughts the same whines and crying I’ve heard from and disdained in others. 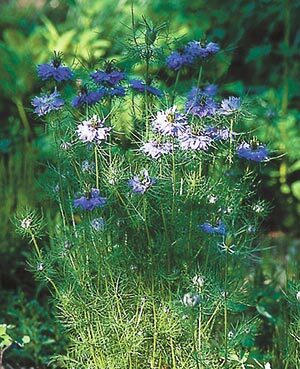 Nigella (Nigella damescena) is one of the plants that Virginia Smith and Wil Strickland call an acceptable weed. It has redeeming physical features and will seed itself into bare spaces before weedier species can do that. This is not a new phenomenon, this reconciliation of garden and gardener over time. Gardeners have made this life passage before. 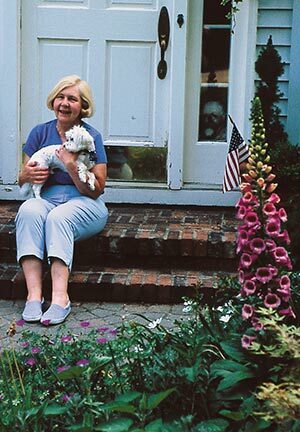 Some, like Mrs. Kissinger, smiled as they went and their gardens reflected that contentment and calm. She found a way to accept the realities, anticipate the challenges, make the changes, and grow old gracefully. It’s been my good fortune as a professional gardener to work with many people and to see many approaches to this phase of gardening. I’ve bailed out gardeners who made commitments beyond their physical means or who fell temporarily behind because of an illness or injury. I’ve worked regularly with individuals who need help on certain tasks but not others. I’ve even drawn and executed designs aimed specifically at reducing work for older or less able hands. Most important to me, I’ve had the privilege of working once again for the smiling older gardener and the wise gardener approaching age. I can understand the need and their advice. Here is what they say. 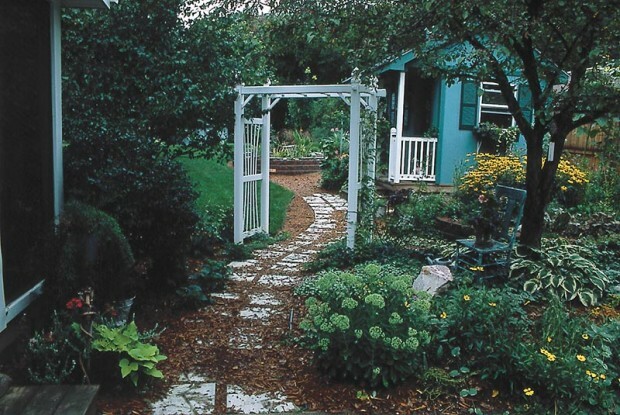 Judith Mueller’s life philosophy helps her to garden as gracefully now as she did 30 years ago. 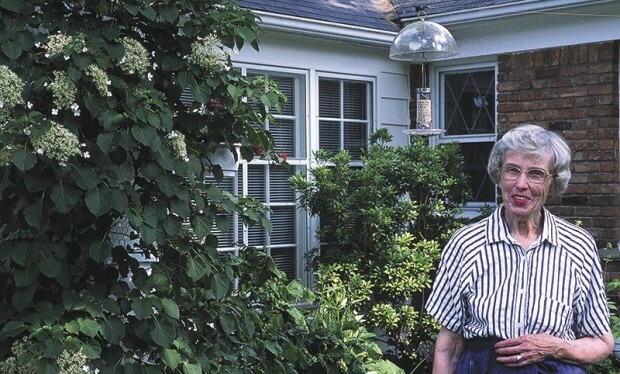 She views gardening as a continual choice, made each year. How she gardens each year changes with her own situation that year. 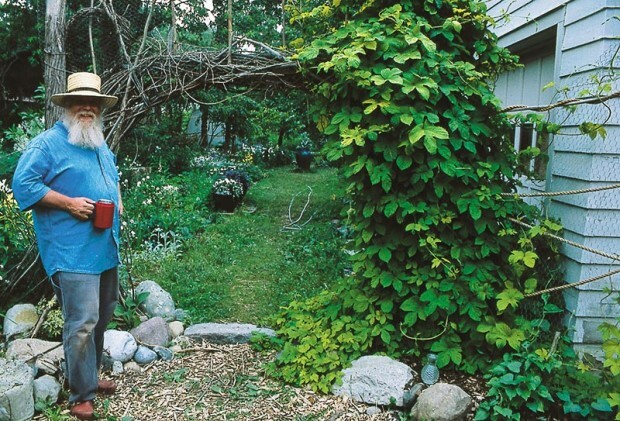 Judith Mueller doesn’t have a grand plan to garden forever, even though she thinks she will. She takes one season at a time. “I know that a garden doesn’t all have to be done today. It’s an ongoing process and it’s not over until I say it’s over. “So I looked at what shape the gardens were in and decided what I could do myself, what I needed to get help for, and what I can let go of and let someone else do. This year that meant I looked around and got help edging and mulching. Someday I might have to cut back, maybe on the size of my beds. Or maybe I’ll have to ask for more help. But I don’t think about that now because for this year I can handle it. One: Choose your weeds. Pick willing spreaders that you can easily identify and don’t mind having in your garden, and let those go ahead and take over. Something like forget-me-nots will merrily fill in bare spaces, choking out what would be less welcome weeds. Two: Mulch. You can’t ever do enough of it. As you approach the golden years, beef up your garden, too, so there is less space between plants, less room for weeds to get started. Make paths wider and easier to walk, like this one at the Sapelak residence. Youthful greediness leads to narrow paths, as we covet every square foot for yet another plant. Wide paths are wiser, and more generous. They are low care and make navigation easier for both wheelbarrow and wheelchair. Having to decide what one can and can’t accomplish and determine what you most want to do with your time has also changed Smith’s outlook on some plants, even weeds. “I’m more patient with plants I used to pull out because they were too aggressive, things like sweet woodruff that take over. I used to pull them to keep them under control. Now I just keep them from choking plants I really like, and enjoy them wherever they’re pretty enough to just put up with. “I enjoy gardening more every year,” says Smith, and she smiles. Article by Janet Macunovich and photos by Steven Nikkila, www.gardenatoz.com. I also have developed more forgiving attitude toward my garden due to age. I have hired help, let groundcovers run wild, filled in hard to weed spots with hostas, and overlooked the weeds. I have never enjoyed my garden more by having time to sit and admire the individual plants as they bloom. A big plus for me is an underground soaker hose system that I can run instead to watering by hand. Janet, you are my facorite gardener. I attended your lectures at Gardenview in Northville and just had your book out reviewing how to winter prune my bushes. Thanks for a timely topic. Thank you for this great article. I too am trying to garden differently and it’s refreshing to know that the gardens need not be perfect. Better to have them work for me and change as the years pass, just as I do! Thank you Janet for your continued contributions. I’ve always enjoyed your articles the most and feel you always convey the best of life in your writing ability. Oh my…how timely this was and affirming! Some hip bursitis has forced me to rethink my garden as well. Upright box gardens from Territorial seeds some 10 years ago which are now reduced to just one for early lettuces and Kale, then replanted with beans along with cilantro that loves to reappear….have helped me make this transition. No need to totally abandon gardening, but set your creative mind in re creating what you love to do. Thanks for this article and for you. I really needed this article. My husband and I have a cottage up north and I have spent the last years devoting my spring to fall days planting, mulching and weeding. This year on our way north he fell and has had surgery and is in rehab. I finally was able to make it up and cried when I pulled in the driveway. My garden looked pitiful. I was there for only a few days and was wondering what changes I could make next year so that I wouldn’t feel so overwhelmed. I got excited again as I started dreaming and planning. I am not giving up I am growing up. New attitude and a new approach. Great article, Janet. These folks are right on. This article couldn’t be more timely for me. I am hobbling around my yard as best I can as I need another knee replacement (had one 5 years ago) and had recently pulled my hamstring on my other leg. My son keeps criticizing me for trying to keep up but I realize I don’t have to do everything in one day (although I keep trying to). I just do the best I can each day, which is how I approach everything. Janet has always been my main inspiration. Thank you for this article. As I age, I realize that all I did at 30 is a little too much in the 60’s. As 70 approaches I see many more years of gardening. That is , if my knees and back hold out!! I love gardening and it makes me happy . I think it helps with attitude, memory, strength,agility and balance and blessed with beautiful flowers.! Fifteen years ago, right after I retired, I participated in the Master Gardener class in Oakland County. You were a guest speaker. I enjoyed your presentation then and have appreciated your perspective many times since. This article, once again, hit home. My gardens are a pleasant way of reflecting on my age now and a younger more energetic time when my husband and I developed them. I’m ok with changes still coming. How delightful to hear my experience (too much, too old, not today)expressed by others!